doi:10.4236/ijcns.2009.27072 Published Online October 2009 (http://www.SciRP.org/journal/ijcns/). 1School of Computer Science, National University of Defense Technology, Changsha, China. the third part authentication, which greatly reduces the probability of “Identifier Spoofing”. based access control has met many challenges. he will lose the access ability of the service. address can represent different nodes at different time. the attacker can hide his true identity easily. misuses will harm the valid users. will make network access control more efficient. 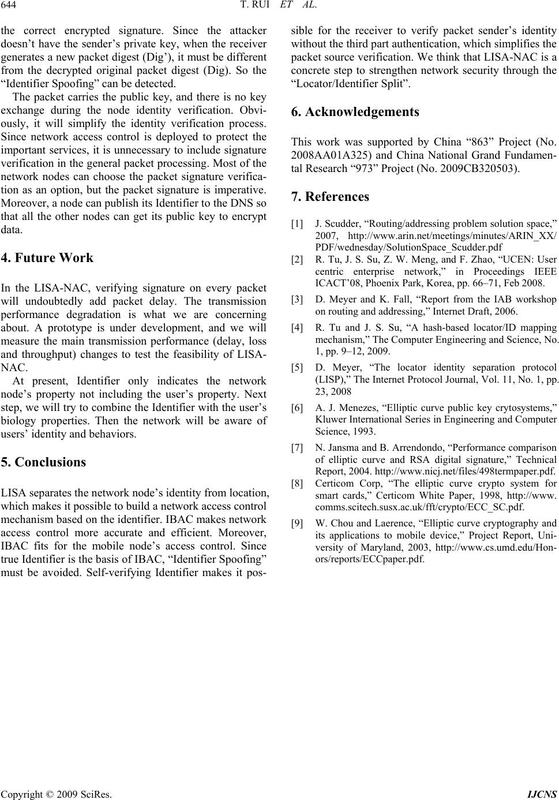 with a summary of the main research result in Section 5.
vided into two parts: kernel network and edge network. but the mapped Locator is variable. control, network accountability should be mentioned. model and the Self-Verifying Identifier. Individual Identifier (I2) and Identifier Affiliation (IA). group of network nod es. that a group of I can perform P on the O.
workload of maintaining the access control policy. also meets the potential threat of “Identifier Spoofing”. present, we adopt 1 60 -bit Self-verifying Identifier. it is useless to make a huge Identifier name space. tion with limited packet delay. Figure 2. Self-verifying identifier verification. “Identifier Spoofing” can be detected. ously, it will simplify the identity verification process. tion as an option, but the packet signature is imperative. This work was supported by China “863” Project (No. tal Research “973” Project (No. 2009CB320503). ICACT’08, Phoenix Park, Korea, pp. 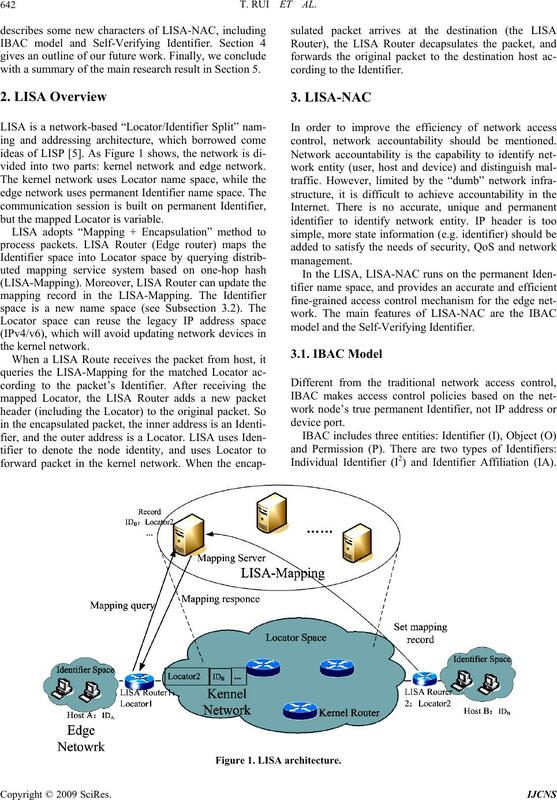 66–71, Feb 2008.
on routing and addressing,” Internet Draft, 2006.
mechanism,” The Computer Engineering and Science, No. 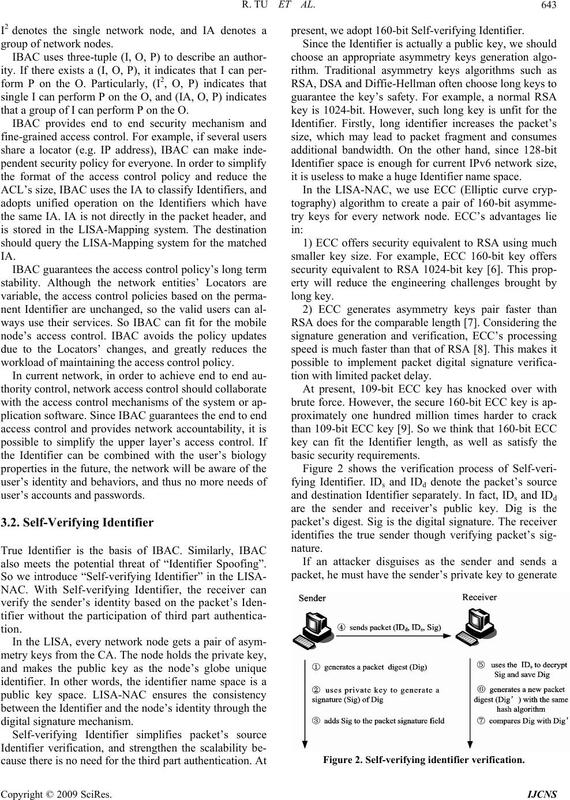 (LISP),” The Internet Protocol Journal, Vol. 11, No. 1, pp. smart cards,” Certicom White Paper, 1998, http://www.